The Contemporary Quilt Group are running the fund-raising tombola this year. The theme is 'Bookwrap Gems' . Make a wrap or cover for a book using any materials, in any style that you enjoy working with. Decorate or embellish as you choose. Congratulations to Wendy for her entry, which was one of the 30 chosen quilts from Britain. Apologies for the angle of the shot, the quilt was hanging on the top row, quite high up! A delightful quilt nonetheless. Well done Wendy. From Aarti J Beads & Trim to Zigzags the Main Hall was filled with everything a patchworker and quilter could wish for and more besides. 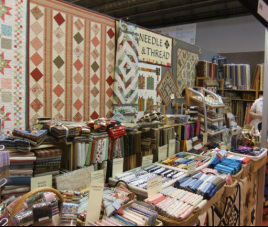 Congratulations to Yvette, her Needle and Thread stand looked lovely and was very busy throughout the four days.